Back in October 2008 I had the pleasure of being able to ride the Coast Starlight over the Tehachapi mountains as it detoured away from the coast line due to track work being performed there. Well, the opportunity is again available for you to take this ride that has not been available on a regular basis since Southern Pacific's San Joaquin Daylight was discontinued with the advent of Amtrak on 1 May 1971. In addition to the fact that this detour only affects the southbound train, the route of the detour is different. The detour in '08 was nonstop (except for crew changes) between Los Angeles and Sacramento. This spring, the detour offers more bang for the buck. Train 11 will operate normally as far as Oakland, but following that will traverse the Altamont Pass (via the original Western Pacific route used now only by freights and ACE commuter trains) and then run down the San Joaquin Valley to Bakersfield where it takes the rugged Tehachapi route, along the west side of the Mojave Desert, and finally down into the L.A. Basin. What is not stated is whether the train will use the BNSF tracks also used by regularly scheduled Amtrak San Joaquin trains, or use the old Southern Pacific mainline. The detour in the autumn of '08 used the old S.P. route, and I expect and hope that this one will, too, so as to really conjure the ghost of the old San Joaquin Daylight. In a springtime as wet as this one has been, it should be a lovely trip across the Tehachapis. You may even see some snow, as you can see in an old April 1971 photo from the last days of the S.P. train that I used in my '08 blog post about the trip. To get the most out of the trip I recommend you book a sleeping accommodation (even though it's a purely daytime trip unless you originate in the Pacific Northwest) so you can enjoy the service in the Pacific Parlour Car. (Remember that when you book a sleeping accommodation on Amtrak it includes your meals.) If your party is one or two persons book a roomette. If your party is three persons you can probably get Amtrak to allow all three to occupy a bedroom accommodation, but you will need to book that with Amtrak's call center (800-USA-RAIL [872-7245]). Otherwise for parties of one or two, you can book either type of room at Amtrak.com or through the call center without having to pay a "live person" fee. Sample prices using availability and fares for travel 10 April from Oakland to Los Angeles as of 20 March 2011. Note that the accommodations charges are the lowest possible but what is actually available when you book may be higher. If you ride the detour comment back on this blog to let other readers know about your trip. 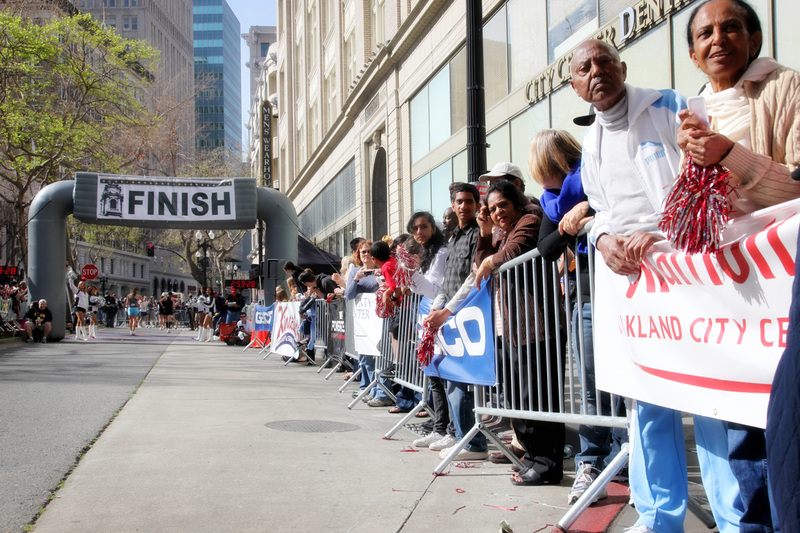 The Oakland Marathon finishes back where it began on Broadway by the spreading oak tree in front of City Hall. From the map at left, it's clear that the the 25-mile point is close to the Lake Chalet. Runners continue north on Lakeside, round the curve by the Essex, and shortly after that they veer ever so slightly to the left on to 19th Street. 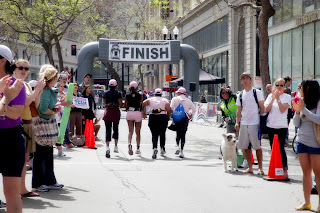 Once on 19th Street, it is a straight shot that crosses Broadway at roughly Mile 26.05, then a block later a slightly backwards left turn on Telegraph in front of the stunningly restored Fox Theater, followed by a few more short blocks to the finish. The stretch of 19th Street that runners cover seems kind of nondescript to the casual glance. At the lake it starts out mostly residential and attractive, becomes generic office building-ish by Snow Park at Harrison Street, then peters out until it hits Broadway. But my recent walk along the street to take photos was fast-paced and superficial. My boss, the four quarters I put in the parking meter, said "step lively", and so I did. Thus it was a happy coincidence that the week's East Bay Express (my favorite free weekly paper - required reading for East Bay residents and visitors) in its annual "Insider's Guide" claimed the "east of Uptown" area was becoming a distinct neighborhood, and went on to cite places to eat and drink as proof. Why paraphrase it when you can read the short article yourself? 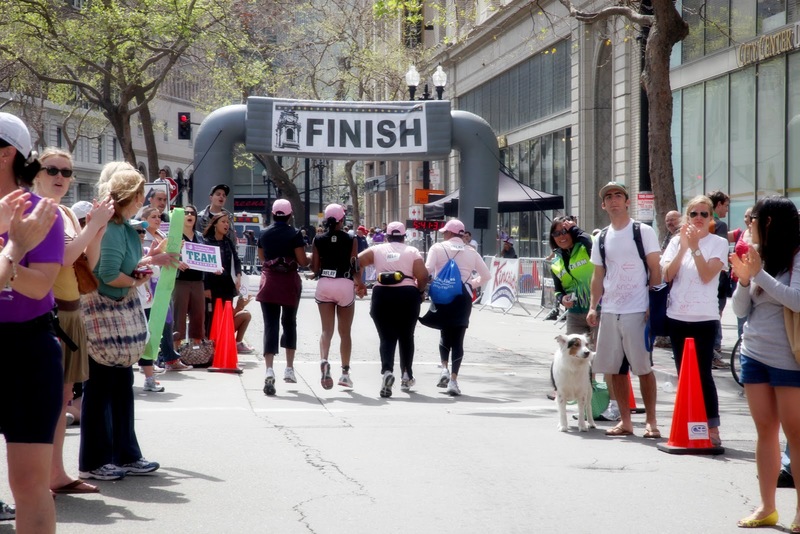 In photos, this is what runners will see in the last mile of the course. 19th Street begins here at Lakeside. Your eyes do not deceive you. It's a short little hill at the start of 19th Street. An oak tree in Snow Park. Cross Broadway, nearly at the spot where your 26.2 mile tour of Oakland began. That's the Fox Oakland one block further. Turn left on Telegraph at the Fox Theater. Looking south on Telegraph at the few blocks that remain. Boy oh boy, are you close now! The race is run, and thus we also come to the end of the Oakland Marathon neighborhood tour. Congratulations to those who ran and to those who read! Now was this the city you thought it would be? Did everything you thought you knew about Oakland, prepare you for the reality that there are many "theres" in Oakland? And there are plenty more "theres", some nice, some not, that aren't part of the course of the marathon and therefore were not a part of the tour. Whether you are a runner or not, why don't you spend a day or an afternoon in one or two of these neighborhoods that you saw on the tour. You'll be quite pleasantly surprised. You might even come back for more. 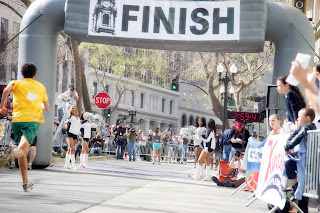 These four women above, finishing in the 2010 inaugural event, provide a nice way to conclude. Probably four friends, or perhaps relatives, they certainly weren't in the ranks of the top finishers. They may have been a marathon team entry. You can be sure they worked hard for this accomplishment, and there may have been times they thought they couldn't do it. But they did. Oakland is like that, too. This city is rising in many ways, even as it struggles with its schools, crime, and political quicksand. 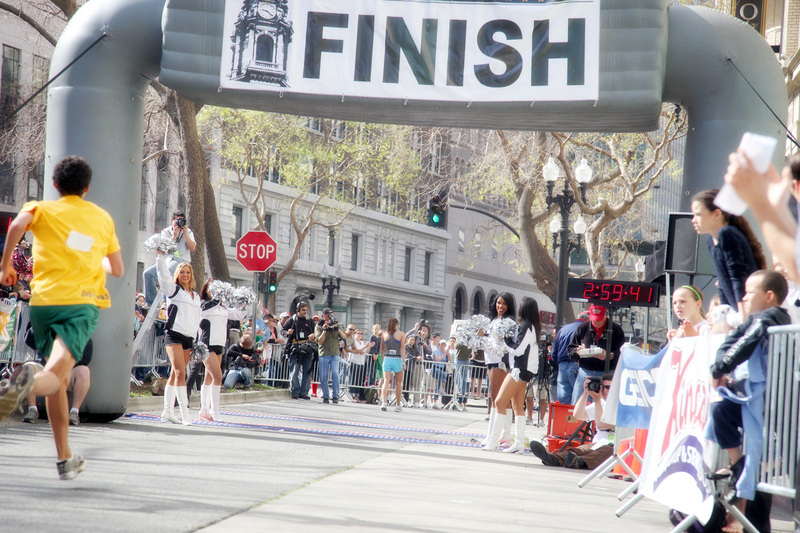 A surprisingly large reservoir of pride throughout the city was evoked in the first running of the Oakland Marathon in 2010. I predict that the race and its beneficial impact will continue to grow, and contribute to the city's evolution. 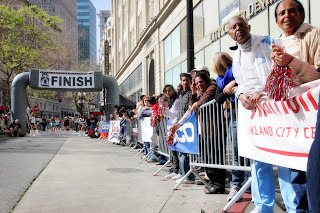 The finish line may be out there in the distance but I'm certain that Oakland will cross it. Lake Merritt is not a neighborhood, but a focalpoint, a convergence of neighborhoods or areas, and Oakland's centrally located crown jewel. It wasn't always that way. According to the detailed Wikipedia article about Lake Merritt, it was originally a kind of anteroom to the estuary that lies between Oakland and Alameda. As the city grew, it became an open-air cesspool for the city's sewage. Samuel Merritt, the mayor of Oakland, proposed in 1868 to clean it up and separate it from the estuary by means of a dam. The project went forward and the resulting lake was eventually and appropriately named in Merritt's honor. Another interesting detail about Lake Merritt I was unaware of until I read the Wikipedia article is that it was the very first wildlife refuge in the United States, dating back to 1870. Over the past ten years, the condition of the lake and environs has improved dramatically due to the overwhelming passage of Measure DD in 2002. Along the east side of the lake, sidwalks and landscaping have been redone, and a rough user-created dirt path at lake's edge has been paved. At the southwest corner the old boathouse has been made into the Lake Chalet Seafood Bar & Grill, a large, beautiful restaurant that is a treat both inside and out. (The owners are the same as those of the Beach Chalet in Golden Gate Park.) In nice weather, tables are set outside on the dock. The building continues to be used as a boathouse, and is also the base of operations for Servizio Gondola an authentic Venician gondola on Lake Merritt. At the south end, a large public works project is underway to transform the viaduct that carries 11th and 12th Streets into downtown Oakland. Upon its completion the concrete jungle area that is the current viaduct will be dramatically transformed with additional park space, better pedestrian and vehicular access, and an improved connection between Lake Merritt and the Estuary. Lake Merritt shares honors with Green Lake in Seattle and Bidwell Park in Chico for being among the three places I've run the most miles. You'll see more runners at Lake Merritt than at any other single place in Oakland. Indeed, the East Bay's most venerable running club, the Lake Merritt Joggers & Striders takes its name from the lake. The club puts on a low-cost monthly 5K/10K race most months of the year on the fourth Sunday. As with both Green Lake and Bidwell Park, the distance one runs when circumnavigating the lake depends on the precise route route one follows as there are numerous variations, but in the pre-GPS watch era I thought the typical lake-hugging path was about a 5K (3.1 miles). From the marathon course map you'll see that from Mile 22 through to about Mile 25.25 is around Lake Merritt, and that's good because it's an inspiring, beautiful, and basically flat stretch. It's a nice way to approach the final mile of the marathon. What follows now is a large selection of photos of Lake Merritt, some with captions and some without. The Camron-Stanford House at the southwest corner of the lake next to the boathouse. This 1876 Victorian is the last of what were once many homes that ringed the lake. Lakeside Drive curving left past the Essex condo, with view that includes the Kaiser Building, the cathedral, and the bandstand in Lakeside Park. Grand Avenue business district. The most noteworthy landmark of the area is the Grand Lake Theater, a neighborhood institution since 1926. It is locally owned, not part of a chain. Whether it's part of the Lakeshore Area or Adams Point may be debatable, but the area just west of I-580 and close to the northeast corner of the lake is pretty. This view is looking west toward buildings that line Grand Avenue. lie between the two arterials. Past Mandana Avenue, Lakeshore is leafy and residential heading northeast in the direction of Piedmont. Grand Avenue, by contrast, remains mostly commercial for several blocks beyond Mandana. But one of my favorite features of Oakland is tucked away off of a sidestreet from Grand Avenue, invisible to visitors, and perhaps largely unknown to other Oaklanders. From Grand, turn left on Jean Street by the excellent nursery (part of the Grand Lake Ace Hardware), go a short block and there you are at the entrance to the Morcom Rose Garden. Park on the street, and then go for a stroll. You will not be disappointed. While it lies within the City of Oakland, the east side of the rose garden abuts the City of Piedmont. I'm placing the the rose garden within the Lakeshore area, but in fact it is sandwiched in between the Piedmont Avenue neighborhood, the Lakeshore area, and the City of Piedmont. An interesting feature of the rose garden is the presence of the annual "Mother of the Year" plaques, set in the pavement roughly halfway up the park. Changing views of the role of women and mothers is demonstrated by the names which begin in 1954. For a number of years the typical name is something such as "Mrs. Robert Smith". Then you start to see names in the style of of "Mrs. Elizabeth Smith". Finally the form that we would find most sensible emerges: "Elizabeth Smith". I'll bet they all were great mothers - it's just nice to know what their names were. The park was dedicated during the heart of the Depression in 1937 (see photo below), though the origins of the park date back up to the 1910s when the land was first acquired by the City. Is it Oakland or Santa Barbara? The Rose Garden Apartments next to the entrance to the park. Jean Street makes a sharp left and rises steeply after it passes the entrance to the rose garden. We end with another relic of the past at the corner of Lakeshore Avenue and Mandana Avenue that continues to serve those of us who walk or drive. It's a WPA concrete imprint by the curb from 1940. Those who relentlessly bash government take note that "awful government projects" such as the Bay Bridge, the Caldecott Tunnel, and the Morcom Rose Garden (all completed in 1936-37) are mainstays of the East Bay more than 70 years after their dedications. The bridge and the tunnel continue to be critical pieces of the region's infrastructure.